Jones Act compliance, vessel security plans, safety orienta- tion, environmental compliance, and operational training. Guard missions and assets. In other words, his skill pack- age runs the full gamut of what OMSA members hold near and dear. 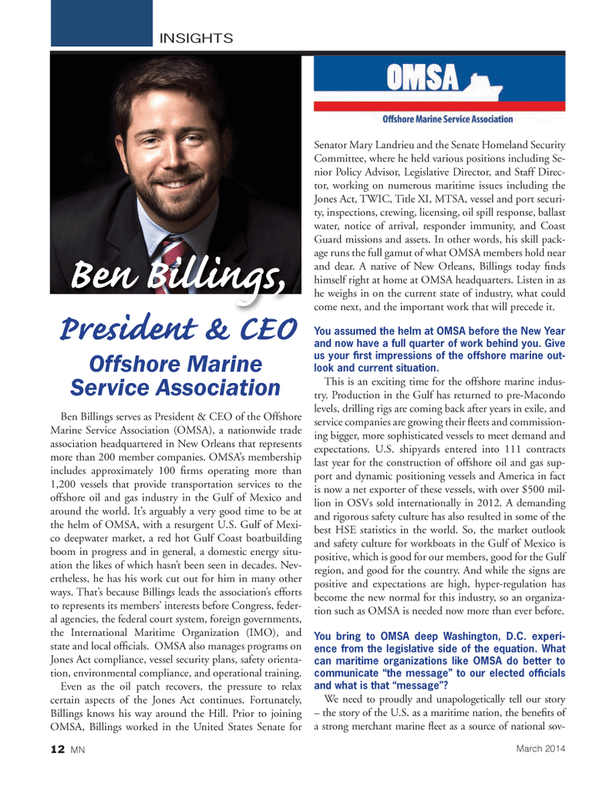 A native of New Orleans, Billings today fi nds himself right at home at OMSA headquarters. Listen in as he weighs in on the current state of industry, what could come next, and the important work that will precede it. You assumed the helm at OMSA before the New Year and now have a full quarter of work behind you. Give us your fi rst impressions of the offshore marine out- look and current situation. This is an exciting time for the offshore marine indus- try. Production in the Gulf has returned to pre-Macondo levels, drilling rigs are coming back after years in exile, and service companies are growing their fl eets and commission- ing bigger, more sophisticated vessels to meet demand and expectations. U.S. shipyards entered into 111 contracts last year for the construction of offshore oil and gas sup- port and dynamic positioning vessels and America in fact is now a net exporter of these vessels, with over $500 mil- lion in OSVs sold internationally in 2012. A demanding and rigorous safety culture has also resulted in some of the best HSE statistics in the world. So, the market outlook and safety culture for workboats in the Gulf of Mexico is positive, which is good for our members, good for the Gulf region, and good for the country. And while the signs are positive and expectations are high, hyper-regulation has become the new normal for this industry, so an organiza- tion such as OMSA is needed now more than ever before. You bring to OMSA deep Washington, D.C. experi- ence from the legislative side of the equation. What can maritime organizations like OMSA do better to communicate “the message” to our elected offi cials and what is that “message”?